Today is my mom's birthday. HAPPY BIRTHDAY MOM!!!! Since birthdays only come around once a year, I thought I'd make her an extra special birthday treat just because. I asked her what she wanted me to make her and she listed off all the makings of a gourmet cupcake, complete with chocolate ganache. Alrighty, birthday girl. My mom is a huge fan of these chocolate raspberry jelly rings you can only find up north, so rather than order a gigantic box of them, I figured it would be more fun to replicate a cupcake after them. Here's the thing. I absolutely, hate making cupcakes or cake for that matter. They never turn out the way I want them to, they are forever dry and crumbly within the next day. But I guess I'm not giving myself enough credit because I've only made them a handful of times. Usually, I just stick with the box variety because those always turn out great, but I've been in the good habit of attempting to make almost everything homemade, so why stop at birthday cupcakes for my mom??? I figured I needed the practice anyway. Preheat the oven to 350 degrees. Line a muffin pan with paper liners. In a medium sized bowl, combine butter, cocoa powder, and chocolate chips. Microwave on 50% power and for a minute or two, checking and stirring every 30 seconds until fully melted and smooth. Set melted chocolate aside to cool. In a second medium sized bowl, whisk together the flour, baking soda, and baking powder. Set aside. In a third large bowl, whisk together the eggs, sugar, vanilla, pudding mix, and coffee until fully combined. Slowly, stir in the cooled chocolate mixture into the egg mixture. While whisking, add in the flour mixture 1/3 at a time, until fully incorporated throughout. Evenly divide the batter among the muffin cups. 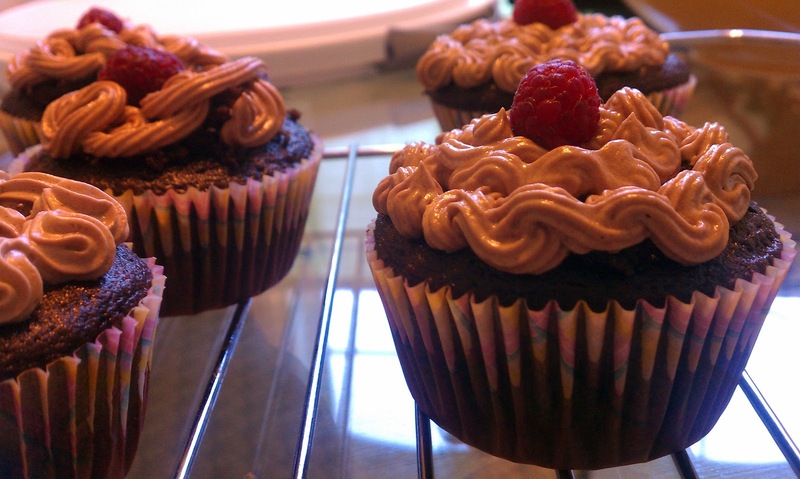 Bake in the oven 15-20 minutes, or until toothpick inserted in the center of the cupcakes comes out clean. Let cupcakes cool completely on wire rack before filling and frosting. Pour the chocolate chips into a medium sized bowl. In a medium sized saucepan over medium heat, heat the whipping cream until boiling. Let boil 2 minutes. Pour the hot cream over the chocolate chips and stir until fully melted and smooth. Stir in the raspberry preserves until fully incorporated. Set aside to cool. In a large mixing bowl, mix the butter using a hand or stand mixer about 5 minutes, or until creamy. Slowly, add in the powdered sugar and continue mixing until fully incorporated and creamy. Add the vanilla extract, cocoa powder, and chocolate raspberry ganache and continue mixing another 5 minutes or until frosting in creamy and ingredients are fully combined. When the cupcakes have fully cooled, spoon out the center, making sure not to puncture the bottoms. 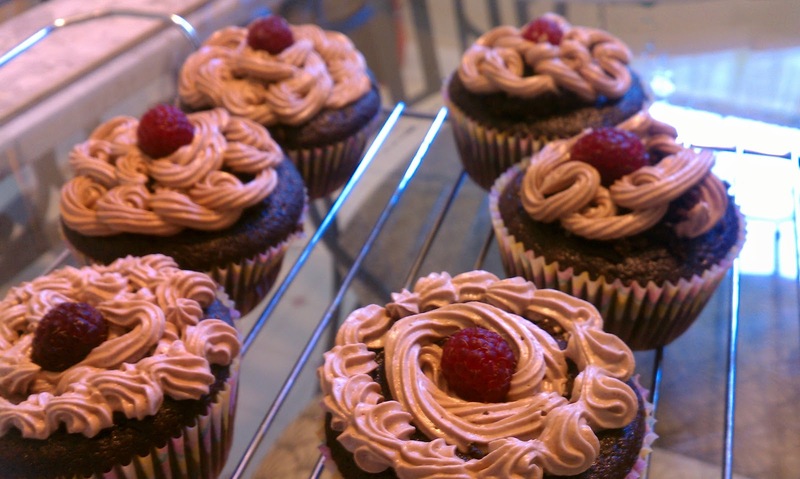 Set the cupcake middles in a small bowl. 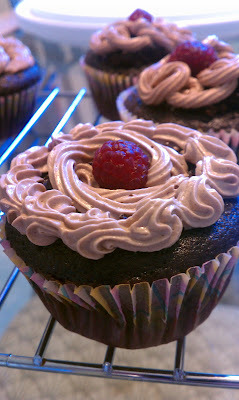 Spoon the ganache in the center of each cupcake until filled to the top, but not overflowing. Cover with the cupcake middles, or the part of the cupcake that you scooped out. Fill your piping bag to the line shown on your bag, and using a star shaped tip, pipe out frosting on top of your cupcakes until fully covered. Be creative with it! 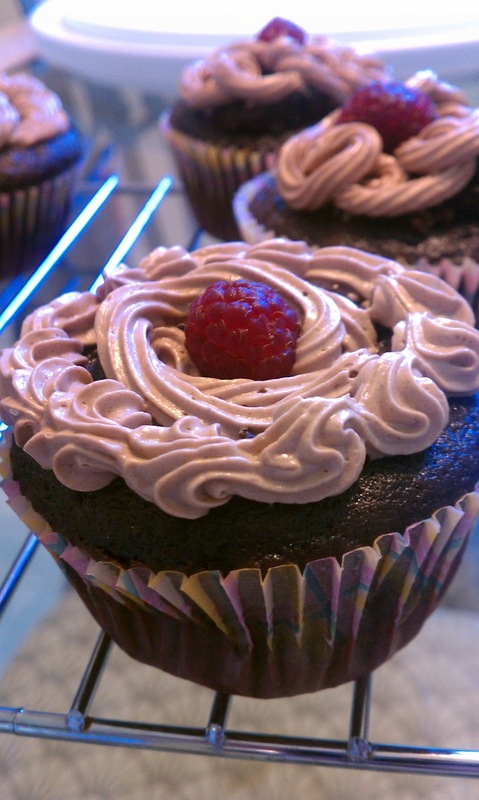 If it's your first time using a piping bag, practice on a tester cupcake. If you do not have a piping bag, see my "how-to" section on how to make your own! 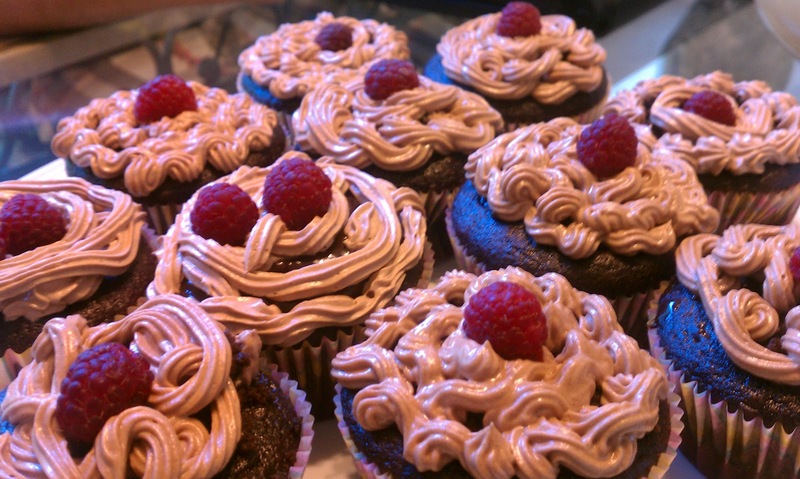 Garnish the tops of the cupcakes with raspberries. Enjoy!! !